To celebrate the Centenary of Victoria Hall in 1997, Sue Lane (Secretary 1993 to present) researched and authored a fascinating booklet giving a full history of the Hall. It's well worth reading. For example, did you know, that from initial meeting to actual building completion was just 7 months? Quite incredible but true! A limited number of leather bound copies of the booklet were produced for the Centenary and you'll see one such cover at the start of the booklet. This cover was produced by Tony Stacey. 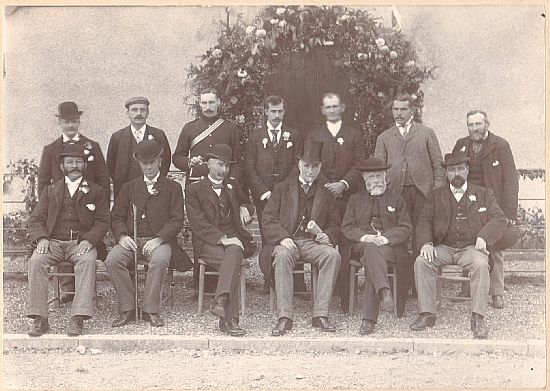 Mary Ridger (nee Griffiths) of Cusop, near Hay-on-Wye,Herefordshire, has sent a photograph of the trustees at the opening of the Hall in 1897. It was found amongst her papers when moving into sheltered housing in Hereford. The possible link is Dr William Arthur Griffiths, the first GP in Wonston and whose efforts led to the building of the Hall. Unfortunately he is not in the photograph. Mary, aged 93, says that William may be a cousin or perhaps no relation at all, but if he was part of her family she would have been proud of what he did. One wonders how the photograph reached Cusop without some family link! Back ro l-r: Frank Wheeler, William Foster, n/k soldier, Charles Humby, W. Witts, Walter Permain. Nichol – merchant, Bulllington House. 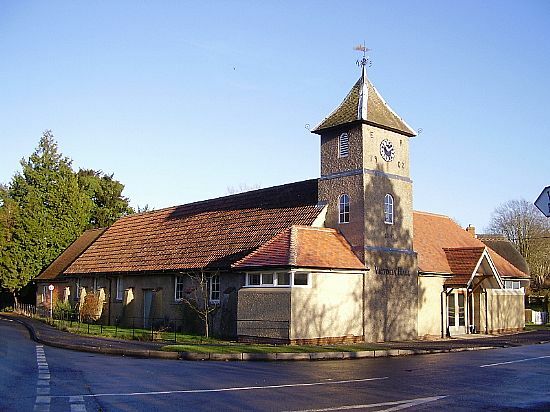 Northbrook – presumably ‘opened’ the Hall.